Until this past weekend, my last BlogHer Conference was 2010’s, in New York City. There are various reasons why I hadn’t returned since then, but they boil down to the conference getting bigger as my connections within its various sub-spheres became fewer. While my interest was piqued by the announcement that ticket sales for 2014’s tenth-anniversary event would be capped at 2500 and that it would be held just 300 miles away in San Jose, I didn’t decide to go back one more time until the conference agenda was posted. My primary insight coming out of this session is that the way I blog, as my credo expresses, means that I don’t foresee bumping into this “pivot” very hard. I think it’s largely because my blogging is much more defined by interests than by identity or by association with a specific lifestyle or life stage. I built in the “randomness” from the very beginning, and I’ve never successfully (or seriously, to be honest) cultivated a “niche”–I think both of those factors free me up to mix it up. Even more surprising to me than attending only one session was that, aside from the discomfort of opening night in the Expo Hall, I got genuine value from interactions with conference sponsors. I’m not much for networking and “connecting with brands,” but I arrived at BlogHer’14 with plans to do just a bit of that. As a book blogger, I wanted to get better acquainted with Shebooks; their open house was on my personal agenda, and I hope to strengthen that connection going forward. But even more, I wanted to do some data-gathering. I’ve been seriously contemplating moving this blog to self-hosted ever since coming back from BEA and joining the Litbreaker ad network, so I was hoping to get some on-site advice from sponsor WordPress. I spoke with a WordPress community volunteer about transitioning, hosting options, and WordCamp, and it was all very helpful and worthwhile. I’m edging ever closer–I really want to give the Ultimate Book Blogger Plug-In a test drive! But of course, the main hurdle right now is figuring out a good time to move it forward. HELP ME! If you’ve moved a blog to WordPress self-hosted, PLEASE share your thoughts, tips, and advice in the comments. I’m especially interested if your experience was relatively recent (within the last year or two), and/or you made the move from the Blogger platform. If you have recommendations about hosting, suggestions to ease the process, or cautionary tales, I want to know! I’m always interested in reading other people’s reactions to BlogHer, and seeing whether they echo mine at all. Some do, and some don’t; few of us have the exact same conference. “This year the conference did show its age a tiny bit, but really that is fitting given the 10 year anniversary that this years conference celebrated. BlogHer featured a series of talks before the keynotes, a roster of speakers chosen to highlight the history of blogging as filtered through the lens of BlogHer. 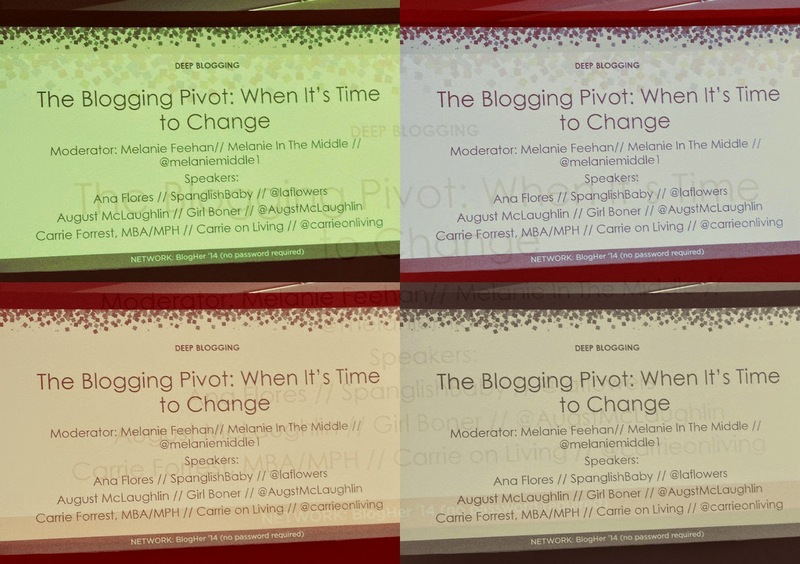 An interesting corollary through most of the speakers is that the BlogHer conference served as an outlet and a springboard for them to move on. I think that is key – they have moved on…The combination between so much reflection on the past and so many speaker repeats, there wasn’t a ton of stuff that felt fresh. “Does the name BlogHer make sense anymore? Maybe they should rename it FacebookHer. Or SocialMediaHer….Sure, there were SESSIONS on blogging, but I had very few personal conversations about blogging…I think we still use blogs as a tool, but are frankly bored about talking about it. “(I)f the co-founders decide to change direction, I would understand. A conference that appeals to personal writers, political activists, businesswomen, and coupon moms ALL AT THE SAME TIME is hard to maintain forever. Splitting up by tribe and demographic might be the way of the future. I can relate to Neil’s last point. While I’ve made efforts to recruit my own tribe to BlogHer, I’ve come to accept that our gathering spot is, and is likely to remain, Book Expo America. I went to BlogHer’14 with few expectations and a middling degree of curiosity. While I was surprised by some of the ways in which my learning expectations were met, my admittedly modest social ones were fulfilled mostly as planned. I expected to avoid the anxiety-inducing big parties, and flew home Saturday evening so I wouldn’t be around for the closing-night hoopla at all. I expected to find varying amounts of satisfaction in the length and quality of my interactions with fellow bloggers–not enough time with some, pleasant surprises in getting to know others–and am pleased to reflect that the overall satisfaction level of those lands at the higher end of my scale. All in all, I’m not sorry I went, but at this point, I really don’t think I’ll attend a BlogHer Conference again. If this IS my last BlogHer, at least I have one of Suebob‘s famous Red Stapler photos as a souvenir.